Well that past two days have been a flurry of spreadsheets for me. I ended up not having to work last weekend, which was great, but I still had work looming over my head. Because I knew that whatever I didn’t do over the weekend was going to be waiting for me on Monday. Not because I’m a procrastinator, but because I was waiting on other people to do their part first. Anywho work should start slowing down a bit tomorrow and fall back into a steady flow by the end of the week. I have a lot of planning to do to figure out how I’m going to get my work done this year when I’m planning to take three months of maternity leave. And also transition planning to figure out who is going to do my job when I’m gone. Lots to think about! When I’m really busy at work like I have been lately, the crockpot becomes my BFF. I need to learn a few crockpot recipes that I can pull out on a moments notice. I don’t really have any good standards, but I have been trying some new recipes lately. Including the one I am writing about today. I found what appeared to be a great recipe in the January 2011 issue of Real Simple (I’m a subscriber). 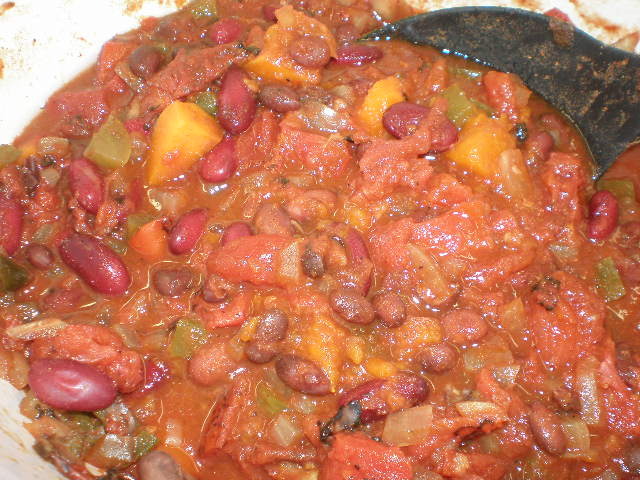 It is for Slow Cooker Vegetarian Chili with Sweet Potatoes. Real Simple is great about including at least one vegetarian recipe in their issue every month. Usually more than that. When I saw this one I thought “I love chili and black beans and sweet potatoes so this will be great!” I decided to try it out a couple of weeks ago. 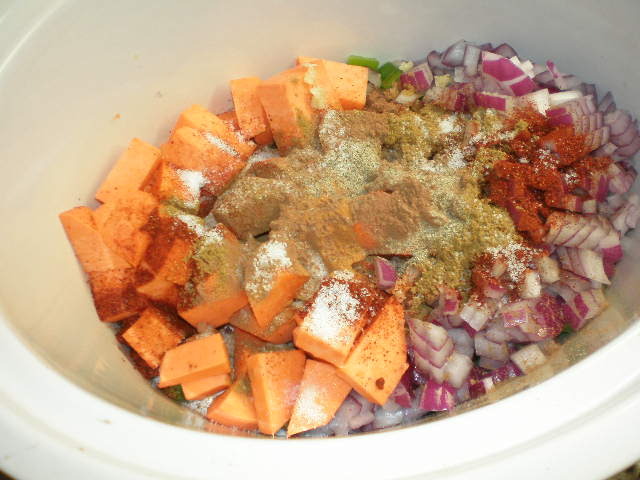 Here’s how the veggies and spices looked in the crockpot before adding the tomatoes, beans and water. I love all the colors. There was a lot of chopping to do, but I believe I got it all together in about 20 minutes one morning. You could cut down on the time by doing some of the chopping the night before. And here’s a shot of the finished chili, after cooking all day in the crockpot. Still very colorful. It smelled delicious. I just love coming home to some good smelling food in the kitchen. First of all because it’s better than bad-smelling food and second because it means dinner is ready. So how did we like it? Well if you haven’t guessed already, we actually didn’t like it that much! It was weird. The day I made this we both ate a bowl for dinner with some tortilla chips. Benzo said it was alright but needed less cinnamon. I thought it was good but not great and that I would probably reduce the cocoa powder. 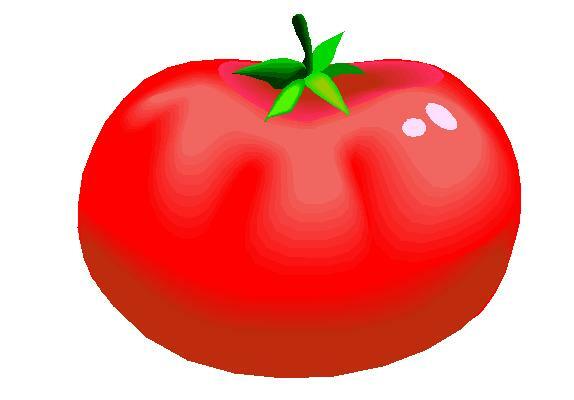 As I finished my bowl I thought the next time I would use regular tomatoes instead of the fire-roasted tomatoes. I was originally very excited to try the fire-roasted tomatoes, so I was a bit disappointed that I didn’t like them that much. There were a lot of leftovers so the next day I took a bowl of the chili for lunch. I managed to eat most of it, but as lunch went on I kept thinking how much I didn’t actually like it. After that neither of us wanted to eat the leftovers. I hate to waste food, but I just couldn’t bring myself to eat it. And in the spirit of honesty, the leftovers still sit in the fridge waiting to be thrown out, probably growing a little mold. If you have any great crockpot recipes and feel like sharing, please do so! I’m always looking for something new to try.